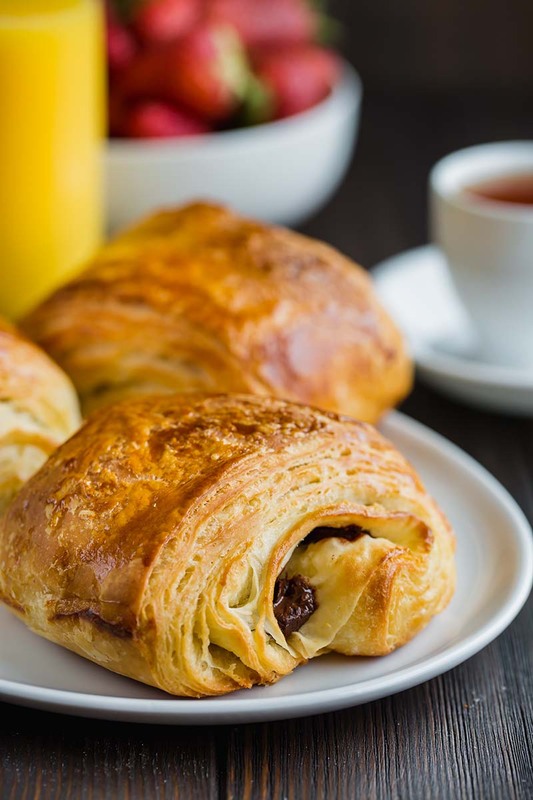 You can achieve bakery-style, authentic pain au chocolat (chocolate croissants) from scratch with these easy-to-follow directions and tips for success! You’ll get crisp flaky on the outside, soft and buttery on the inside croissants with perfect amount of intense chocolate in every bite! Step 1. To make the dough, in a large mixing bowl with dough hook attachment, combine all the ingredients for the dough and mix until the dough comes together, about 5 minutes. Transfer the dough onto floured surface and knead for a minute. Flatten it into a disk and place it in the floured dish. (I use 8×8-inch baking pan.) Cover with plastic wrap and refrigerate for at least 6 hours, or overnight. Step 4. Place the prepared square butter in the middle of the dough so that corners of butter are pointing to the middle of sides of the dough. Fold the edges like an envelop and pinch the seams securely. Step 5. Roll the dough into 8×24-inch rectangle. Again, it doesn’t have to be exact measurements, but do your best to be close to that. Fold into thirds and cover with plastic wrap. Refrigerate for 30 minutes. Step 6. Repeat step 5 two more times with 30-minute rest in the fridge in between. If the dough resists too much at any point, refrigerate for an additional 10-15 minutes. Step 7. After 3rd rolling, fold the dough again into thirds, cover with plastic wrap and refrigerate overnight, or at least 8 hours. Step 8. Cut the dough into 2 equal parts and roll each one into 8×22-inch rectangle. Make sure to lift the dough before final measurement, because it shrinks back a little. Step 9. Using a sharp knife, cut each dough into 4 rectangles. You should get 8 rectangles total. Step 10. Place 1 piece of chocolate on one edge, and the 2nd piece in the middle of rectangle. Starting with chocolate edge, roll the dough tightly. Place it on a baking sheet, lined with parchment paper, or silicone mat. 4 pain au chocolat per baking sheet with ample space in between. Step 11. Cover with plastic wrap and rest for about an hour, or until doubled in size. Step 12. Preheat the oven to 425°F (220°C). Step 13. Right before baking, beat egg yolk with 1 tablespoon of water in a small bowl. Brush the egg wash over the croissants. Step 14. Bake for 20-25 minutes, until golden brown. Serve warm. Store the croissants in airtight container at room temperature for up to 2 days. Freezing instructions: Once you shape the croissants, instead of proofing, simply place the baking sheet into the freezer for at least 3 hours, or until completely frozen. Then transfer them into a ziplock bag. These can frozen for up to a month. To bake the frozen croissants, first thaw them on a baking sheet, lined with parchment paper, or silicone mat covered with kitchen towel on the counter overnight. In the morning, continue with step 11. You can also freeze baked croissants. Thaw on the counter for a couple of hours.